First time using Airbnb. LOVED this house! It was absolutely perfect!! Received a call from property team member 2 days prior to our stay welcoming us and also verifying that we received an email from them regarding property information etc. nice touch...excellent customer service. The home was absolutely stunning! Everything that it was described as. Will definitely return and use Foothills Property Management again. I asked some questions and they are always quick responses. This is amazing house! It definitely was more comfortable than the hotel! I was very satisfied with my experience. The property was pretty mush as I expected. It was clean, and well stocked with dishes, linens, etc. The only issue regarding supplies was that we ran low on toilet paper. I like where the house is located. The only things I would like to see improved is for there to be hand rails at the door leading into the kitchen and off the back porch into the yard. Also, better installed safety rails in the tub and shower. Other than these minor details--which are really just personal preferences---GREAT PROPERTY AND SERVICE!! The Foothills team is friendly, efficient, and professional in every way. In addition, they listen very well, a quality usually not present in today's world. Great experience all around. This cozy, warm home with just breathtaking views has been a pure joy to visit. Again the views of the surrounding Sedona red rock mountains are nothing short of epic, especially at sunrise and sunset. The neighborhood is clean and very quiet. 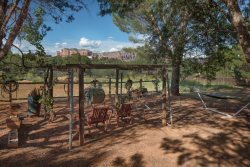 The house is very close to all the attractions of Sedona. Whole Foods grocery or the Safeway are only minutes away. Everything in this house has been tastefully upgraded and is very user friendly, there is even a well stocked Keurig coffee machine. Outside is a grill and table for dinner under the stars. We highly recommend this great place and we will be coming back again. Great location with all the amenities of home. Our rental home was amazing. Incredible views and the home was so comfortable. It had every amenity you could want. One of the nicest vacation homes we've ever rented. Everyone is super friendly and supportive! The property is in a perfect location and a wonderful gathering space for friends and family. We appreciated your fast response to our problem. I felt it was going to be hopeless to get a serviceman since it was Christmas. Thank you. I had a wonderful visit in the little cottage in Cottonwood, it was quaint, clean, close to the Main Street, it was fabulous! The staff answered all my questions immediately. My stay was amazing and I will be back!